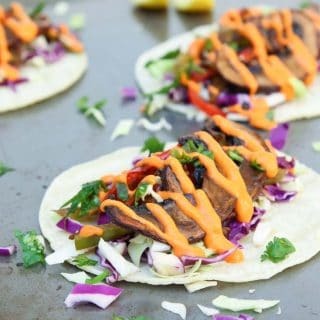 These tacos have balsamic marinated portobello mushroom slices, roasted veggies, crunchy red cabbage, and creamy spicy sweet and savory sauce! They're super easy to throw together on any weeknight! Combine all the ingredients for the marinate into a small bowl. Place the thinly sliced mushrooms in a mixing bowl, pour the marinate over the mushrooms, and toss well to combine. While the oven is preheating, allow the mushrooms to marinate. Toss once more in between so that all of the mushroom slices are well coated. Once the oven is at 400 degrees, line a baking sheet with parchment paper and place each mushroom slice in a single layer on top. Oven roast for 10-15 minutes. Once done, remove from the oven and set aside. In the meantime, continue to the next step. Heat a non-stick pan on medium heat. Add 1-2 teasp olive oil, and saute the thinly sliced red bell peppers, green bell peppers, and red onions on medium-high heat with a little salt and freshly ground black pepper. Mix frequently until all the veggies are completely sauteed and slightly charred. Set aside. Grill each corn tortilla on both sides in a non-stick pan. To make each taco, place a small amount of shredded red cabbage along the center, followed by some roasted veggies (red/green bell pepper + red onions), and 2-3 roasted portobello slices. Squeeze a tiny bit of lemon juice on top and garnish with some fresh cilantro. Finally drizzle a generous amount of Spicy Roasted Red Bell Pepper Sauce on top and devour! Prepare the sauce 1-2 days in advance. You can also prepare all the veggies the day before and store in the fridge for quick assembly. If you have not made the sauce ahead of time, broil the jalapenos and red bell peppers for the sauce (see recipe ) prior to roasting the mushrooms so that you can prep the sauce while the mushrooms are roasting in the oven. Kid-Friendly - You can omit the spice by simply omitting the jalapenos from the Spicy Roasted Red Bell Pepper Sauce.